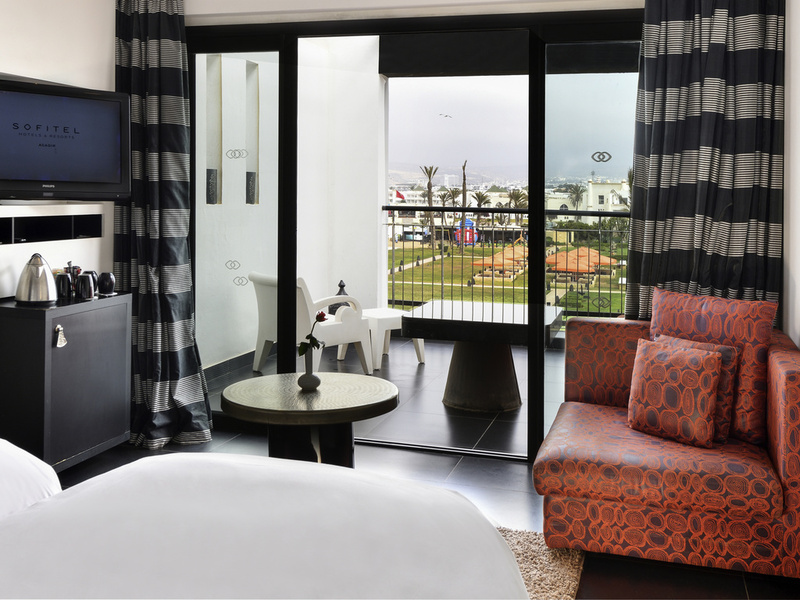 Immerse yourself in the world of seaside chic at Sofitel Agadir Thalassa Sea & Spa - a haven of peace featuring modern decor where art, fitness and balance are at the heart of wellbeing, leaving you feeling rejuvenated. 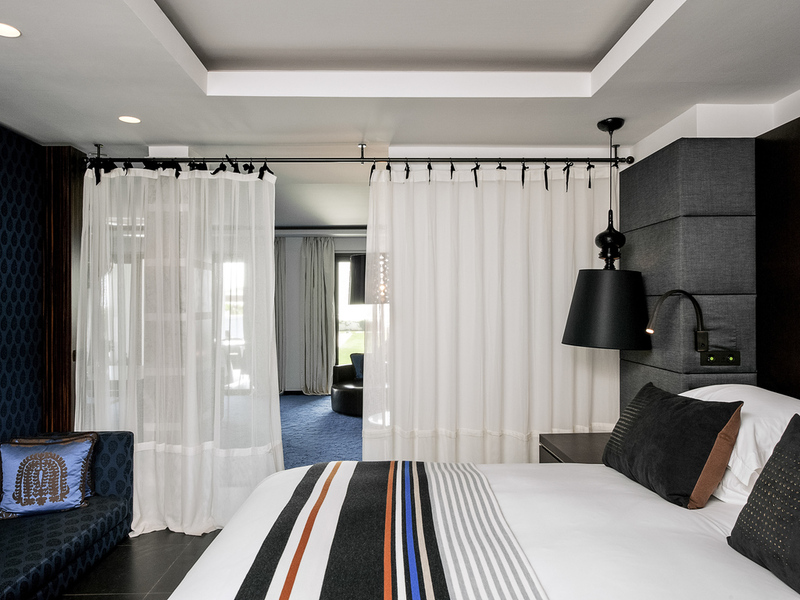 Designed by Moroccan architect Jamal Lamini Alaoui and French interior designer Didier Rey, the venue inspires peace with shades of black and white and the use of exquisite materials - a tribute to modern styles and Moroccan culture. The Thalassotherapy and Spa Institute was designed in the same vein and features immaculate white decor in a detoxifying setting that enables guests to relax in the gardens overlooking the beach as they enjoy the perpetually mild climate of Agadir. Lastly, experience the 'Art Gallery' packed with sculptures, paintings and photographs that change with the seasons, and attend exhibitions to discover or rediscover all the secrets of current artists. Between golden sand dunes and the sea, welcome to Sofitel Agadir Thalassa Sea & Spa - a haven of peace where art, fitness and balance are at the heart of wellbeing, leaving you feeling rejuvenated. Life is Magnifique in Agadir.. 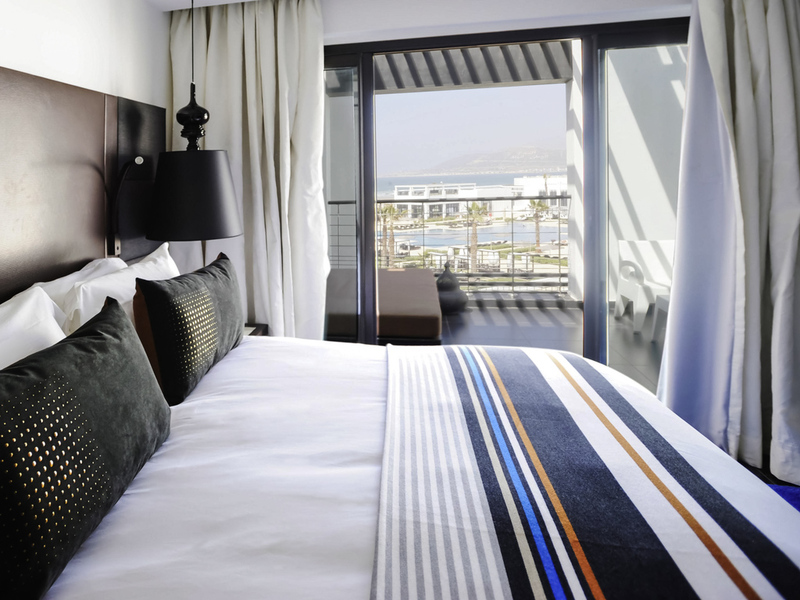 Featuring modern decor overlooking the beach and sea, the hotel provides the perfect backdrop for exclusive shared moments. Indulge in the 'Berber Beauty Escape' signature treatment. A sensory journey based on treatments inspired by Moroccan traditions, combined with the benefits of the sea and the earth. Whether it's on the terrace of your suite, on the private beach at sunset or in the private gardens, make the most of our butler service to arrange the perfect dinner for the perfect night together. What could be better than a private aperitif at sunset, with the calm sea and Oufella mountain as your backdrop? Butler service, unique setting, champagne and floral arrangements - everything you need for the perfect night! Agadir is a superb spa destination in southwest Morocco that promises to restore your health and vitality with its Atlantic breezes, pristine seawater and health-giving seaweed. Stroll the beach promenade to Agadir town for a lively souk, shops and cafés. Agadir's Al Massira international airport, with connections to Europe's major cities, is a 40-minute drive from the hotel. Arrange a pick-up or follow signs for Agadir Centre-Ville (center) and Founty. The hotel is on the beach, overlooking Agadir Bay. 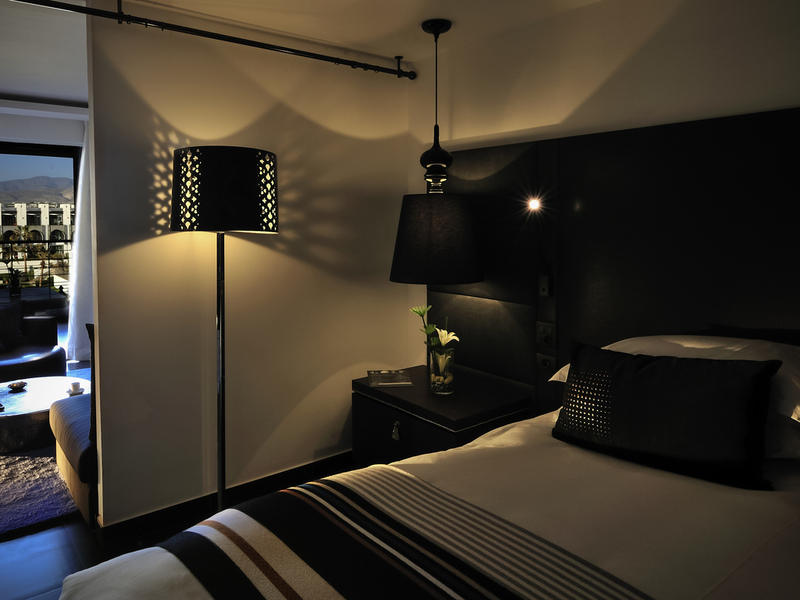 Dark, muted tones combined with elegant materials give you a feeling of privacy and serenity in the heart of Amazigh capital. 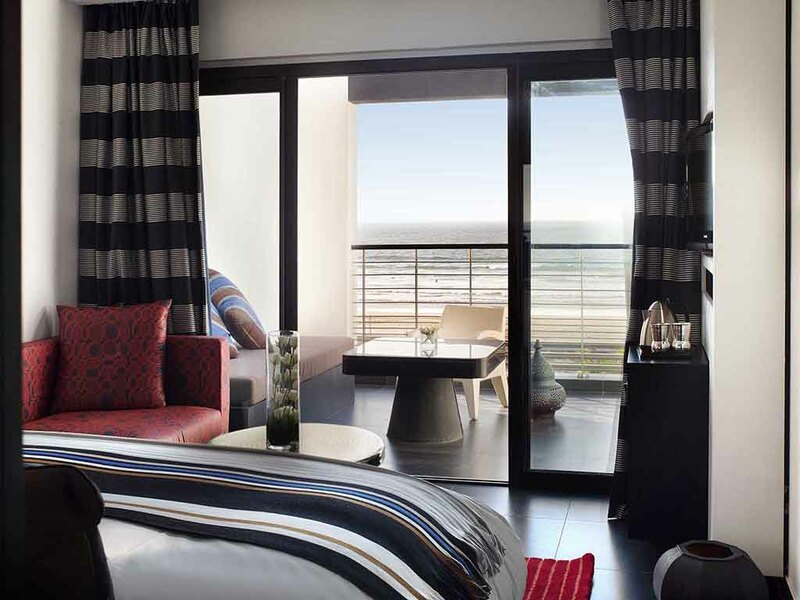 All rooms and suites have a furnished terrace or a balcony with a choice of views over the swimming pool, dunes or sea, each with soft, natural light. 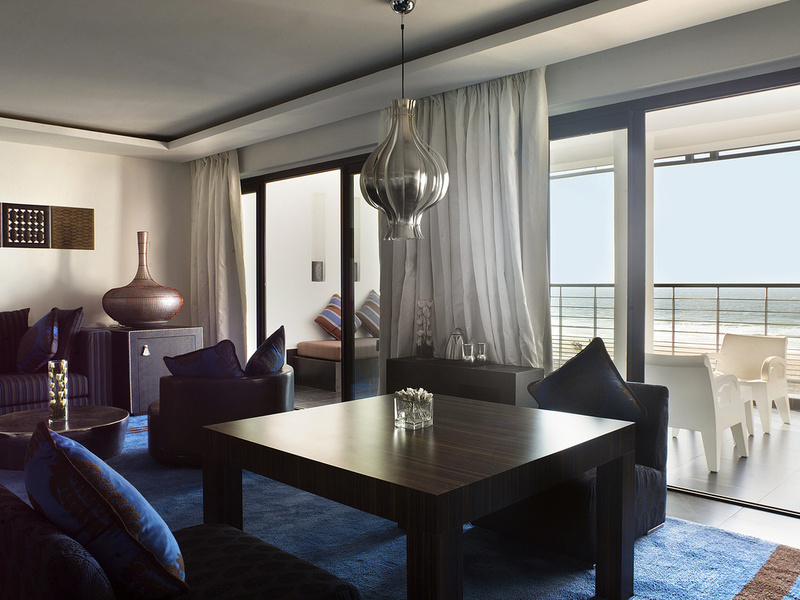 With 49 Suites, the hotel is an exclusive address for the most discerning travelers. A bedroom and large lounge opens onto a furnished terrace creating a real haven of peace. Here, space and amazing views are key. 269 sq. ft. (25m²) with balcony or terrace. Sofitel MyBed bedding, free WIFI, welcome products, safe, air conditioning, bathroom with LED shower, kettle with a selection of teas, herbal teas and coffees. SUPERIOR ROOM, 2 Single Size Beds, pool view. LUXURY ROOM, 1 King Size Bed, garden view. 376 sq. ft. (35m²) with balcony or terrace. Sofitel MyBed bedding, free WIFI, welcome products, safe, air conditioning, bathroom with LED shower, kettle with a selection of teas, herbal teas and coffees. LUXURY ROOM, 2 Single Size Beds, GARDEN VIEW. LUXURY ROOM, 1 King Size Bed, side view of the ocean. 376 sq. ft. (35m²) with balcony. Sofitel MyBed bedding, free WIFI, welcome products, safe, air conditioning, bathroom with LED shower, kettle with a selection of teas, herbal teas and coffees. 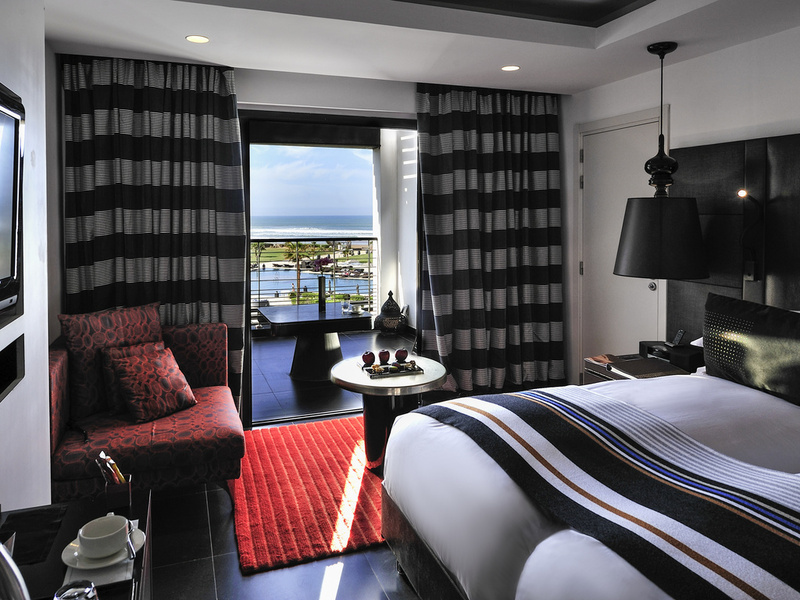 JUNIOR SUITE, 1 King Size Bed, views of the pool and ocean. 538 sq. ft. (50m²), lounge opening onto a terrace or balcony allowing you to unwind and take in the relaxing view. Sofitel MyBed bedding, bathroom with bathtub and LED shower, Hermès welcome products, free WIFI, Nespresso machine, safe. PRESTIGE SUITE, 1 King Size Bed, side view of the ocean. 807 sq. ft. (75m²), combining light with large spaces. Lounge opening onto a terrace or furnished balcony, Sofitel MyBed bedding, 2 TVs, bathroom with bathtub and LED shower, Hermès welcome products, free WIFI, Nespresso machine. PRESTIGE SUITE,1 King Size Bed, front view of the ocean. 807 sq. ft. (75m²), combining light with large spaces. Sofitel MyBed bedding, lounge opening onto a terrace or furnished balcony, 2 TVs, bathroom with bathtub and LED shower, Hermès welcome products, free WIFI, Nespresso machine. OPERA SUITE, 1 King Size Bed, private pool, garden view. 1184 sq. ft. (110 m²) suite combining luxury with intimacy, featuring a heated pool, Sofitel MyBed bedding, 7-day butler service, 2 TVs, bathroom with bathtub, LED shower, hammam, whirlpool bath, Hermès welcome products, free WIFI, Nespresso machine. Sofitel offers Club Millesime or Club Sofitel rooms and lounges that provide additional benefits with personalized service. Attentive services from dedicated team of staff and butlers in the comfort of the Club Lounge and rooms. Sofitel Agadir Thalassa Sea & Spa offers a choice of 3 restaurants, each offering varied and delicious culinary experiences in a bright, contemporary setting - a real treat for the eyes. The nearby Sofitel restaurants are also available. As its name suggests, the Le Medecine Bar in Agadir specializes in health and well-being. The fresh fruit smoothies flavored with aromatic herbs, leather sofas, and the swaying curtains makes this the perfect place to relax after sunset. Experience healthy fine-dining in Agadir in this sleek, floral-scented restaurant, where the head chef reinterprets French cuisine with a Moroccan twist. Fresh herbs and spices add flavor and nutrition to the best local, seasonal ingredients. A Moroccan ambiance fills this casual Agadir restaurant, where you lounge on sofas, perch on bar stools or relax on the terrace. Breakfast buffets feature seasonal fruits; at dinner, watch chefs conjure up market-fresh Moroccan cuisine in a show kitchen. Share the magic of food prepared with products straight from the sea. The perfect way to cool off before heading off to relax in the sun. Try smoothies made with fresh fruit or tasty vegetables on the terrace overlooking the ocean. At nightfall, our trendy bar offers house cocktails in an ambiance brought to life by jazz and lounge music. Share good times over a drink while relaxing in the sun. 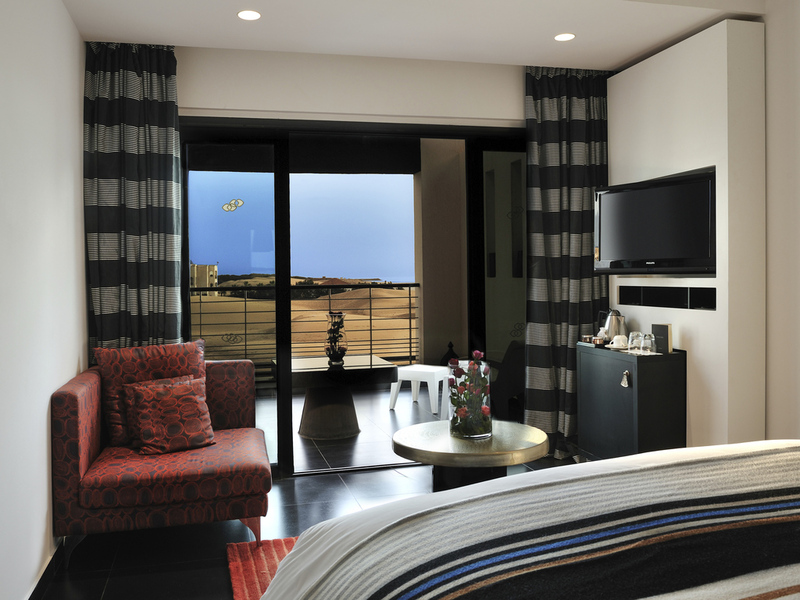 Take in the tranquil yet stylish surroundings with ocean views. Only about a 3-hour flight from Europe's major cities, Sofitel Agadir is the perfect place to hold your seminars and motivational events. Host nearly 650 people with our 9 meeting rooms and take advantage of your dedicated InspiredMeetings concierge. With a sunny and mild climate all year round, the resort offers unique and surprising settings for your coffee breaks, lunches and dinners, and our teams are always on hand to enhance the experience for all of your guests. Sofitel Agadir Thalassa Sea & Spa has lots of unique settings in which to hold motivational events and team-building exercises, and has an array of original, tailor-made activities that focus on team dynamics. Choose the endless beach with its golden sands as the backdrop to your big day for a chic Moroccan setting. Hold your wedding just a stone's throw from the water's edge to add exoticism and wonder to your ceremony. During the day, unwind at the Pool Lounge Bar as you sip on a delicious smoothie. In the evening, dress up in your finest and head to the Amane Bar terrace for an aperitif at sunset, while listening to the sultry voices of a live jazz group. Between golden sand dunes and the sea, welcome to Sofitel Agadir Thalassa Sea & Spa - a haven of peace where art, fitness and balance are at the heart of wellbeing, leaving you feeling rejuvenated. Discover Sofitel Agadir Thalassa Sea & Spa with sweeping views of the Atlantic Ocean and let us assist in planning unforgettable excursions and treatments: a luxurious massage at our Institute or a horse or camel ride along the beach. The outdoor swimming pool will be closed from May 17 to June 17, 2018 inclusive for renovation work. 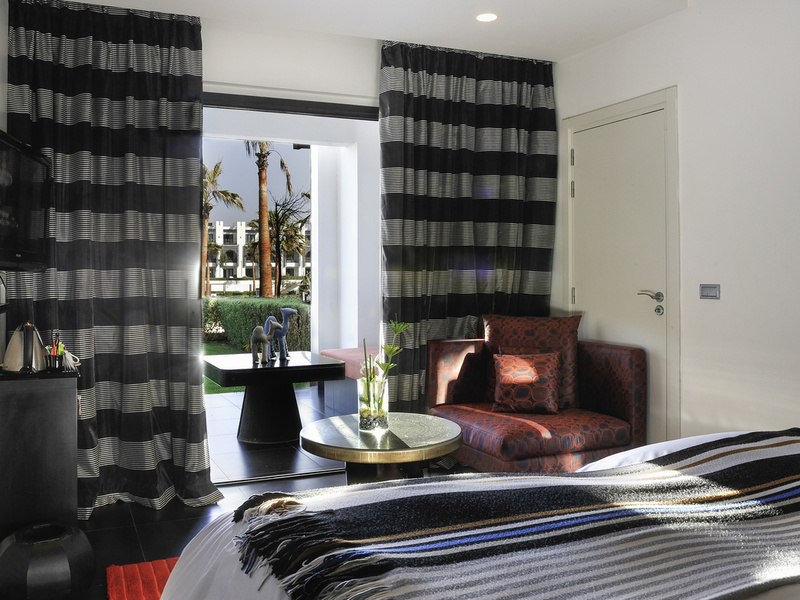 Our guests will receive free access to the swimming pool of the neighboring Sofitel Agadir Royal Bay Resort. Only 15 minutes from 4 golf courses in the city center and the Golf Training Center - ideal for practicing - the hotel combines a friendly atmosphere with dedicated services to meet the needs of golfing enthusiasts, amateurs and professionals alike. Like to keep fit while you travel? The So FIT gym features a complete range of Technogym cardio- and weight-training equipment, with relaxing views over the hotel swimming pool. All guests enjoy free access 24 hours a day.